Are you as excited as we are about the upcoming boating season? Did mentioning "Spring" in our title for the third time in 10 days give us away? We armed you with some great spring commissioning resources last week, but thought it was worth another look after BoatU.S. 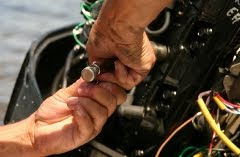 announced the top five causes of springtime boat sinkings earlier this week. The list was compiled from a summary of BoatU.S. marine insurance claims files. BoatU.S. has their own spring commissioning checklist which is worth checking out, along with more details behind their top-5 list, at their website. After last week's post, we received this very useful spring commissioning article by Cpt. Vincent Pica, a District Captain in the USCG Auxiliary and publisher of the Atlantic Maritime Academy website. And of course we also encourage you to review our spring commissioning post from last week, which includes tips and resources from several other trusted sources.